Now, because I also work with digital audio and as a hobbyist musician with a home recording studio, I have learned that it is best to record a track with good levels, that is, not “too hot” near the 0 dbfs (which would clip, similar to over-exposing a photo just when it clips on the highlights) or too low where it would be closer to the digital noise in the lower parts of the track (similar to underexposing). This in audio changes very much between 16 bit and 24 bit audio files, but I'm not going to get into this here. The point is that if you do record too low, chances are that you will have to increase the gain of that track in post (just as increasing exposure of an underexposed photo in post), and if you do that, not only are you increasing the loudness of the recorded material, but you are also dragging that lower noise on the floor of the track with it, and this noise is not a pretty natural analog sounding noise, its just harsh sounding digital noise, so it's good practice to better increase the volume in your recording pre-amp where it's still analog right before the A/D conversion, and it sounds, well, more natural. Why am I trying to denoise a photo taken at high ISO if I had to push the sensor's pre-amp on the analog side of it before it was converted to digital to have proper exposure. I could of done what a lot of people do which is terrible practice, and that's underexposing it to later increase it in post just to see all this horrible “digital” noise appear like magic before my eyes as I would make it brighter with the exposure levels. Then I end up with a noisier image than the one shot at a higher ISO to get the right exposure. So what is wrong with my picture then? Did I really do wrong if I had to increase the ISO to get a proper exposure? So it's just noisy. How bad is this high ISO noise then? If I try to make this photo “noiseless” I will practically just kill all the details in it and end up with something that looks like a washed charcoal drawing. In audio we also have denoising algorithms to make audio cleaner. Truth is, they do pretty much the same as photo denoising. A total disaster to the details. In audio, denoising makes things sound muddy because it really takes out a lot of fine details away that share the same frequencies with that noise, so to prevent using it we just believe in doing a proper recording from start so it should not go through this type of aggressive manipulations. This reminds me of the 80's. For those who lived through that era, you do remember when we listened to cassettes and the beautiful “hiss” it had, right? That hiss was something wonderful wasn't it? I think we all kind of hated actually, but it was somehow part of the music in a way. Remember when Dolby noise reduction came out? Ah! We thought “Finally! Something to put an end to this terrible hissing!” Some of the best stereos and cassette decks had it. It was a technological breakthrough. It would magically take that hiss away, but guess what? It would also take away a lot of high frequency details from the music with it. High hats, cymbals and other high frequency details sounded kind of “dull” with it on. Personally, I would end up turning the darn thing off because I wanted to hear the music the way it was recorded even if there was that little bit of hiss on it, ah such a terrible sacrifice, actually, music sounded much better without Dolby and the hiss wasn't really that bad after all, or at least we learned that from the result of trying to get rid of it. Then I thought, what did real film photos look like when taken at high ISO's. 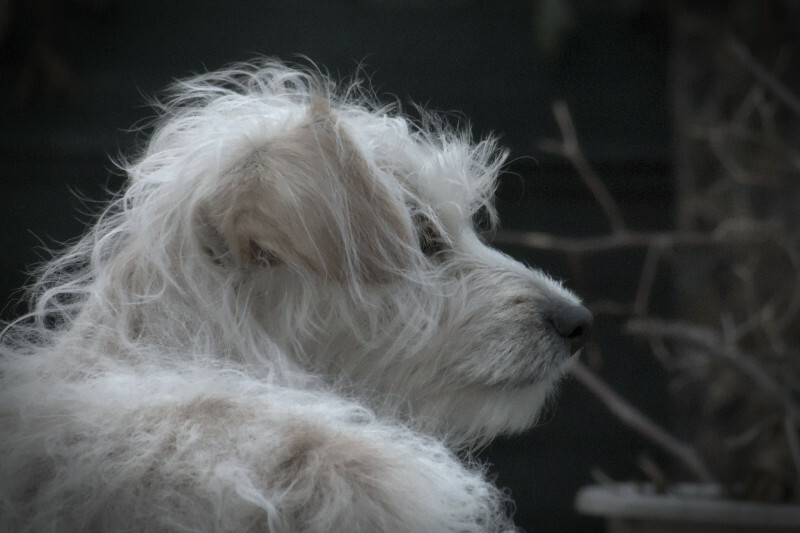 I don't think there really is or was a native 1600 ISO film speed like the digital version photo of my dog but there must of been a kind of pushed film ISO to reach high speeds in film if I remember well. I have shot film myself, I just have never shot above ISO 400, I think, and if I did, it must of been very uncommon for me. I have mostly shot ISO 100, 200 and 400 on film, and the truth is that I have even forgotten what film really looks like because I use a digital camera now and all the photos I see on the web today are done with digitals at low ISO's, or probably higher ISO's but with extreme denoising and resized to 2 square inches for Instagram and other social media sites where I can't really see all the real details. And that's the problem today. We worry more about how it will look on the web instead of how it will look on paper. So I started looking for “classic” film photography. Please note the word “classic”, where I am not trying to say old photography from the 20's, 30's or even 60's or 70's. I am talking about 90's! Just about twenty years ago! That's not so long ago! Is it? Well, maybe depending how old you are. So as I'm browsing photos from that decade shot on film, mostly ISO's 200 or 400, I was astonished! I saw more film grain than my ISO 1600 photo noise! Yes, that was “natural” film grain where mine is a combination of both analog and digital sensor conversion noise with maybe some extra sensor heat. Film was just film and it was natural without limits, not like RAW files where today they are usually limited to 12 or 14 bits of data, but those film photos were grainy, and at lower ISO's, and goodness! They looked beautiful with that grain! They looked like real photos! Why are we trying to achieve ultra clean photos and who told us they should look like that from now on? When did all this “denoising” stuff start? Why have we become so afraid of using higher ISO's if some of the higher end cameras provide us with ISO's as high as 6,400, 12,800 or even more? Why do photographers today keep saying that they never go above ISO 400 or such because the noise suddenly becomes unbearable to their eyes at higher ISO's and in a contagious manner they keep advising other newer and un-experienced photographers to do the same? We all know that in digital photography there are two types of noise. One is color noise or also known as chroma noise. The other is lightness noise. Both are treated in very different ways. Now, color noise is very easy to take away without doing any damage to the photo, no matter how high the ISO, but lightness noise is another thing, and when we remove the color noise, the lightness noise takes an appearance similar to film grain, and the higher the ISO the grainier the photo will look when removing that color noise. The more we try to remove the lightness noise (grain) the more details we take away from the photo resulting the smudged look. Is this grainy noise really so bad after all? Compared to the film days it doesn't seem to be that way. But here's the main problem. We work with photos today on a computer, where we see them on computer monitors. When we see these photos on computer monitors we usually see them at 100% size, right? But 100% size of what? Print size? Nope! When you see a photo at 100% zoom factor on your computer monitor you are not seeing it at print size. This is where the meaning of “Pixel Peeping” comes in. Because not only are you seeing your photo blown up at a scale that it's not the real size of what it would look like on paper. We sometimes even zoom in 200%, maybe even 400%, (I blame myself for doing this too, we all do it, we can't help it) what exactly are we looking for at those zoom levels? At that scale we will not see anything but just noise and oversized pixels with all types of "crappy" artifacts that will just make us doubt about the quality of the photograph. Our computer monitors have a dpi resolution of about 96dpi, to print a high quality photo on paper, this has to be done at least at 300 dpi. We have to learn to see our photos also at that size when working on them to get an idea of how they will look like and see if the noise or grain is so bad after all. This is why we scale our noisy or heavily denoised images down to try to hide all those artifacts before we post them in our favorite social media sites. Most image manipulation and photo editing software have a function where you can see the photos at true print size by getting the information of your monitor's dpi resolution, this will show you the photo right before your eyes at the true size. Another thing we should do is do a rough print to see how bad that noise is. I'm pretty sure that on paper it will be a very different thing. The transition from film to digital photography in the last two decades. Terrible information found on the internet about how bad noise is in photography and how it has just become common “word of mouth” information. Stock photography sites that reject photos because they have a certain amount of grain, and this makes the fear grow bigger in newer photographers today. Software developers that specifically build “denoising” software to make photographers believe it's extremely necessary, such as Topaz Denoise, Neat Image, Noise Ninja, and such. I have tried them all. They all do the same thing. Destroy details! Sometimes I contribute with stock photography in a few sites, not the best place for a photographer, but it sometimes helps to make some extra cash. I have had as many photos accepted in them as I have had rejected ones. This is no surprise to me or anyone who contributes in these sites and truly doesn't even affect me in any way, but it does make me wonder. Most of my photos that have been rejected are mostly because of the "noise" levels. So I started shooting ISO 100 stock photos and started gaining fear to raise my ISO, and those shot at lowest ISO are the ones that pulled thru. The following is a very clear example of this hish ISO fear. I was reading a way to reduce noise with higher ISO's by average blending multiple shots, a common technique used at high ISO's with static objects. So I decided to give it a test, and it turned out to be extremely effective! 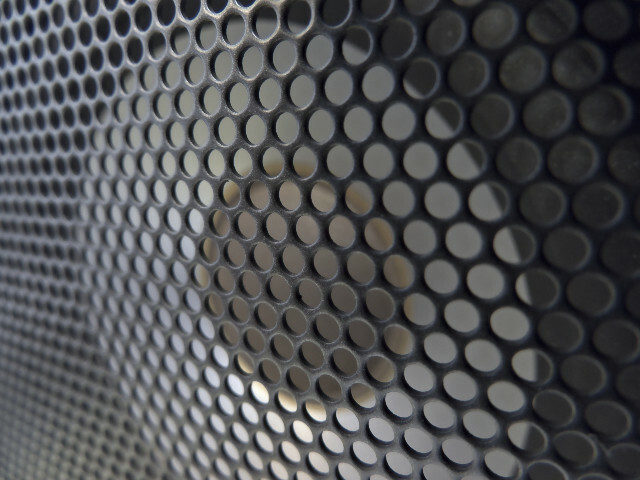 I was able to shoot a closeup of a speaker cabinet and the grid at ISO 800 in a dark environment, so to expose right I pushed my ISO up. For this I took a total of 8 or 10 identical shots with the same exact settings and then do an average blend of all the shots to "average" out the noise since noise is arbitrary and random and voila! The result was a photo that looks probably cleaner than ISO 100! The photo was perfectly accepted in one Stock site and I was thanked as usual with my contribution, if they knew I only did it as an experiment, they'd probably just reject it. A few days later, I received an email from another stock site where I submitted it. Their response? "We are sorry, we can't accept this photo since it was taken at a very high ISO and it could have high amounts of noise. We hope you understand, blah blah, blah..."
Did they even look at the freaking picture? Do these people care about other things aside of noise like composition, colors or something visually more artistic? (Not saying the photo should be hanging on the Louvre) I'm sure they at least check if it's not something pornographic or of the like...right? I'm sure they do look at the picture, they are "curators" after all, or at least that's what they call themselves, the issue is that they also look at something else, the EXIF data, and on that data it clearly says ISO 800, so I'm sure that made them raise an eyebrow if not, maybe both, and maybe even curl their lips. Is it possible that just the fear of a high ISO seen on the EXIF data can make a photo practically useless and maybe even worthless to a stock photography site? What I see in the crop above, is nothing but a noise free image. Maybe just some focal length blur from the macro, which is something different. But if you do see noise on this image, I would gladly like you to tell me exactly where it is, because I can't seem to find it and you might become an excellent curator! If you would like to inspect, or if better say "pixel peep" this photo better, I have it on my flickr account, where you can see it a 100% and also clearly see the EXIF data there. I think that as photographers (whether pro or hobbyists) we should really stop doing what we are doing to our work these days and re-educate the media that grain can be just perfectly normal on photos taken at higher ISO's , and not let them manipulate the way we work. Back in the film days it wasn't even considered a problem and it was far "worst" than what today's ISO's deliver compared to those back then. It was just normal, and photographers went on with their lives because that's the way it was, suddenly we made a big deal out of it. I think a real photographer will use the ISO he/she needs to have the shot. Only an un-experienced one would prefer to not take the picture at all even if his/her camera have high ISO capabilities. The photo below is a photo of mine taken with true film at ISO 400, click on it for a larger view and you can see the huge amounts of grain in it. If you shot this today with a digital at same ISO 400 and just remove the color noise you would still have a much "cleaner" looking photo than this one. Even if the photo was in color. "If a photo is so boring that all you see is the noise, then it must be a very boring photo"
We are forgetting to see an image as a "whole" because we are lost at looking at details that will not be seen in normal print sizes or even more by average viewers. Now I go back to the photo of my dog. 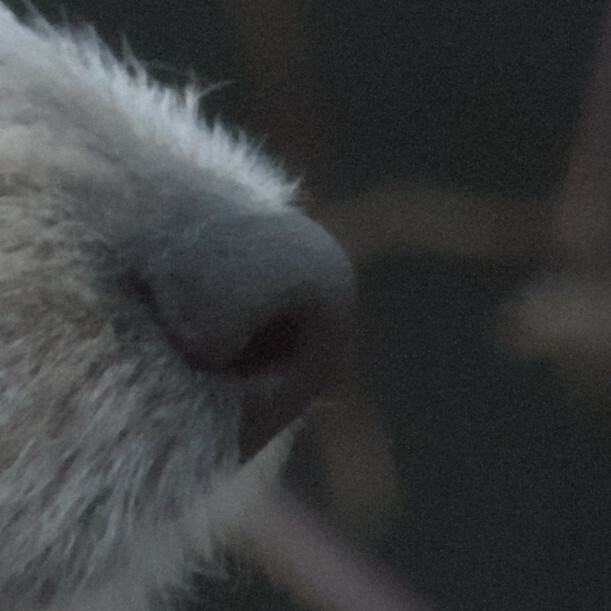 This is a 100% crop of his nose with absolutely no denoising of any kind. Quite terrible I would agree. I could go higher than the 30% on the lightness noise, but I wanted preserve his hair details at the best, so there is a grainy look after all. 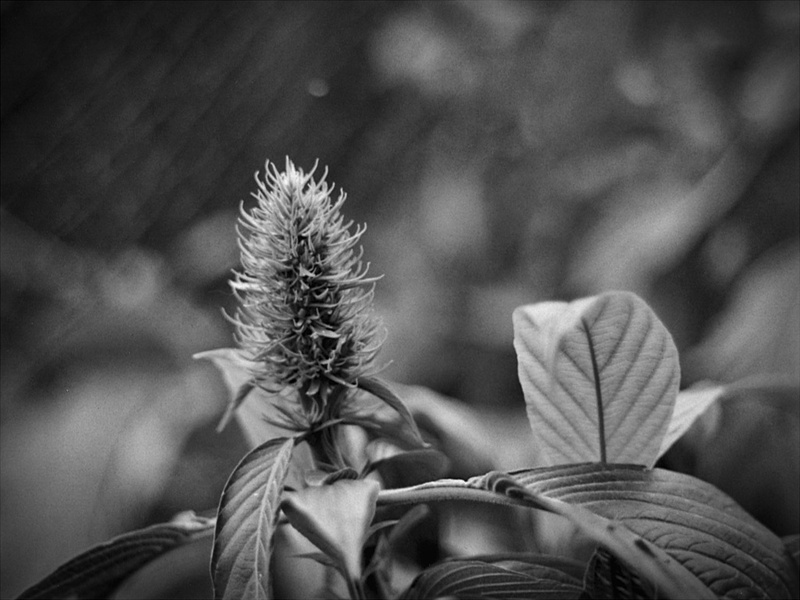 So for a 1600 ISO shot compared to the 400 ISO of my B&W film shot I can only say that this one is much cleaner. 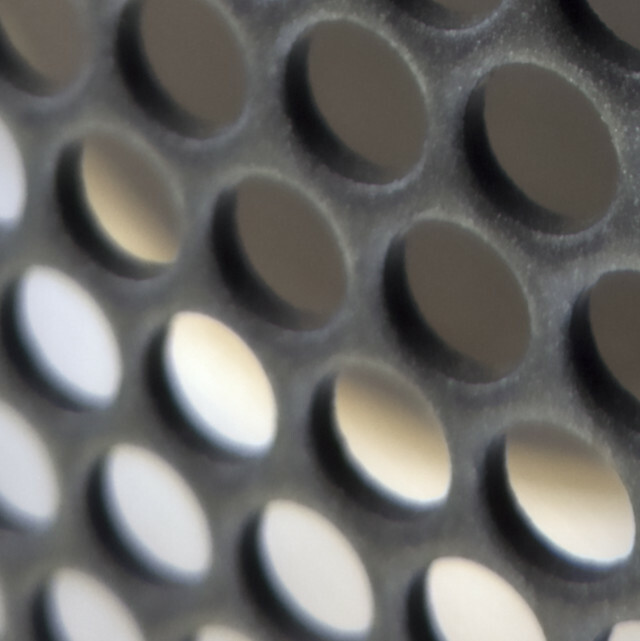 If I wanted to make a super large print size like A1 or A0 this is no problem, because we all know that the human eye has a lower dpi resolution and at that size we have to start stepping back to see the image as a whole and the dots and noise will blend making them practically invisible. Not a great photo, but a beautiful memory for me that was saved from going to the trash by respecting the way it was taken. So the whole point of this post is to prove that denoising at extreme levels isn't necessary and leaving some of the grain is perfectly fine and that we have to stop doing so much damage to our photos if we really respect what we do and stop fearing high ISO's and higher ISO noise to the point that it will prevent us from taking a shot. Higher ISO noise will always be far better than the noise from an underexposed shot that was later brightened in post, or even better than no photo taken because we were afraid of some noise. We have to stop telling newer photographers to only shoot at low ISO's, I think that is the worst advise in today's photography I have ever heard! People have made a big deal out of something that it's not so bad, and we must put an end to that worst piece of advise. We have to stop "pixel peeping" and scrutinizing our work at zoom levels beyond the real thing. We have to stop relying in software companies that tell us that high ISO noise is a terrible thing. We have to stop thinking how our photos will look like on Instagram and other social media sites and think more like photographers. We have to think more on how our work will look like once it's printed on photographic paper. If we get a shot at low ISO, great! If we have to max the ISO, that's great too! And just go on with it, it might become a great selling shot even with the grain. You just never know. So if you ever have doubts about noise (or grain mostly) in your photos, just go out with a real film camera loaded with whatever the max ISO you're comfortable working with in your digital and shoot for a while, look at your developed film shots and remind yourself that you can achieve cleaner results today with your digital than what you got on film. So don't try to denoise a photo so much when it probably doesn't even need it, you'll just make a mess out of it. Though most people focused on losing weight those are dieting, the reality is that they should be lots focused on losing fat in the body. The numbers on your extent are far less essential than the quantity of your waistline; however that is something that some people truly focus on. Through the Eat Stop Eat program, you will know how to lose weight fast without exercise use a system of intermittent fasting to assist you lose weight & also encourage drop of body fat. Latest sports news of today from around the world with in-depth analysis, features, photos and videos covering football, tennis, motorsport, golf, rugby, sailing, skiing, horse racing and equestrian. We are best and trusted bangladeshi online news portal website. Everyday we publish the national and international latest news. If you want to get regular newslatter from our newspaper, please go home page কম্পিউটার and click the below subscribe button. Get the latest CNN technology news education: breaking news and analysis on computing, the web, blogs, games, gadgets, social media, broadband and more. We are the world best leading online newspaper portal. You all are the most welcome in our newspaper.If you want to get regular newslatter from our newspaper, please go home page entertainment news and click the below subscribe button. Politics at FOX has news, opinion and analysis of American and global politics Find news and video about elections, the White House, the U.N and much more. What You Need To Know About political news from us. The latest FOX Business News: breaking personal finance, company, View the latest business news headlines about the world's top companies, and explore articles on global. Latest sports news articles from around the world with in-depth analysis, features, photos and videos covering football, tennis, motorsport, golf, rugby, sailing, skiing, horse racing and equestrian. Get the latest FOX technology news world : breaking news and analysis on computing, the web, blogs, games, gadgets, social media, broadband and more. Get the latest FOX science news today and Environment News: breaking news, analysis and debate on science and nature in the UK and around the world. Get the latest FOX health news headlines: breaking health and medical news from the UK and around the world, with in-depth features on well-being and lifestyle. What You Need To Know About The daily life yoga? Get the latest lifestyle news with articles and videos on pets, parenting, fashion, beauty, food, travel, relationships and more on Fox news.